Kohlrabi, my garden's "Let's try something new" veggie for 2011. Duh, I know what kohlrabi is. It’s a member of the brassica clan, i.e. cabbage, broccoli, cauliflower, Brussell’s sprouts, etc. All the brassica veggies are basically the same plant. One’s leaves form a head, one green florets, one really floppy outer leaves, one’s stem produces tiny head at the axillary buds. And in the case of kohlrabi, the stem swells up to the size of an ostrich egg. Careful now, Dainty. You’re showing your botanical geek side. Calm down. Calm down. I’ve never grown it before. Dad and the farm didn’t grow it either. But this year I bought a 6-pack of kohlrabi transplants as my “Let’s try something new” experiment. Why not, right? You only live once. Might as well grow some kohlrabi. As you can see, my six transplants turned into 3 harvestable (barely) knobby things. One didn’t make it through the transplanting. One actually grew into broccoli. Note to self: Don’t buy transplants from the store again – your transplants labeled zucchini were actually yellow squash and the purple eggplant turned out to be white. As for the last transplant – no idea what happened to that, I lost track of it. Oh, well. Anyway, so I’m here with three kohlrabi. One looks pretty good. One turned into the funniest looking kohlrabi ever – I expect my award in the mail any day now – and one looks like it’s been sitting in the hydrator a little longer than it should (true, every word). And I have no idea what to do with them. Oh, sure, I’ve Googled. Saute it like broccoli stems. Cube. Puree. Middle Eastern and Indian dish galore have found their way into my searches. But I’m stuck. Folks, I’m at a loss. Indecision is a horrible thing. So, dear Daintyites, , I’m looking to you for suggestions. Any ideas? Anyone? If you have a recipe – any recipe at all – please leave a comment below. I may need to hit the farm stands and gather up more of this brazen brassica. § 3 Responses to What to Do With Kohlrabi? I had Kohlrabi for the first time this year and here is how I prepared it. Bake in the preheated oven until browned, 15 to 20 minutes, stirring occasionally in order to brown evenly. Remove from oven and sprinkle with Parmesan cheese. Return to the oven to allow the Parmesan cheese to brown, about 5 minutes. Oh yeah. Parm. e. sean. Makes everything delicious. Sounds like what we do with broccoli. You never know with some transplants you buy. I found a lovely nursery where I bought two tomato plants. The purple stripe turned out a very pale yellow and the Mprtgage Lifter tuned out to be something totally different as well. I won’t be going back there next year. 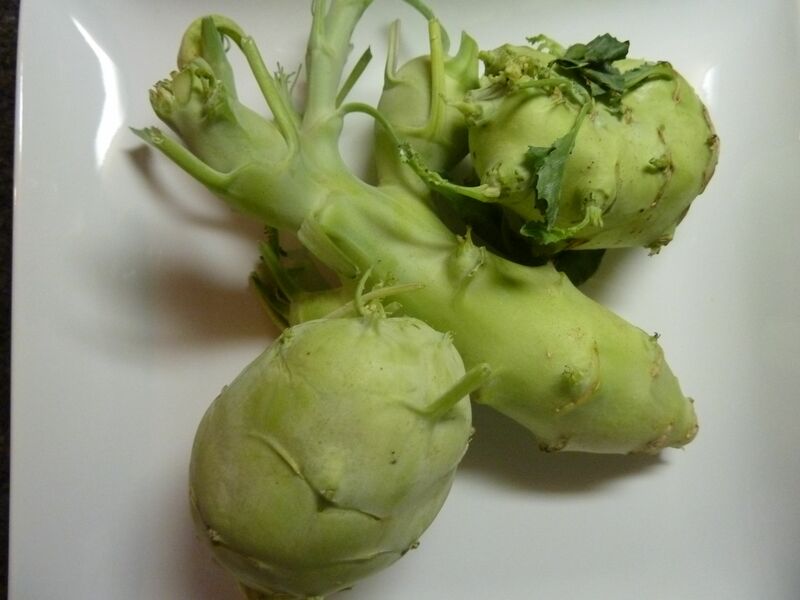 You are currently reading What to Do With Kohlrabi? at The Dainty Dot.